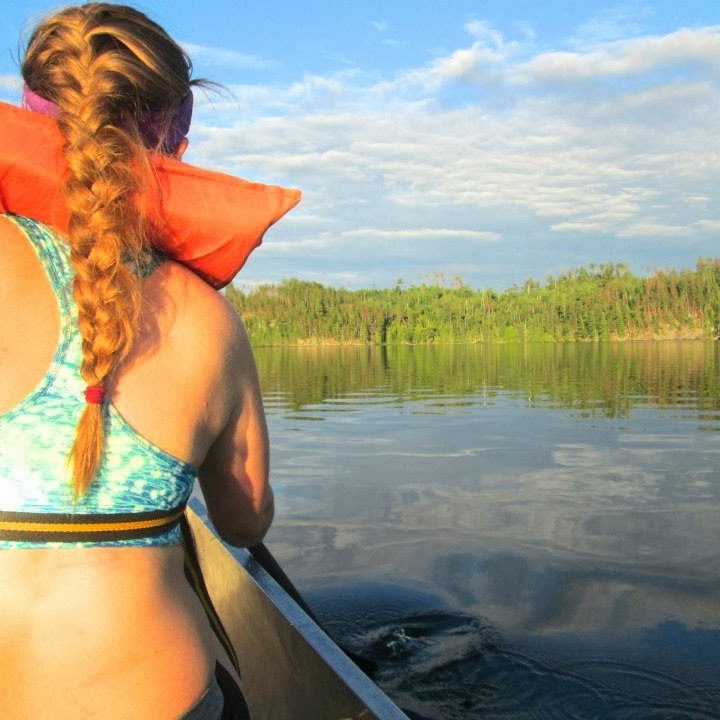 "Campers will paddle and portage the lakes of northern Minnesota's Boundary Waters Canoe Area, one of the most beautiful and pristine wilderness areas in the country. The location is sure to live up to its reputation with outstanding fishing, abundant wildlife, crystal clear nights, and breathtaking scenery." Sound appealing to you? 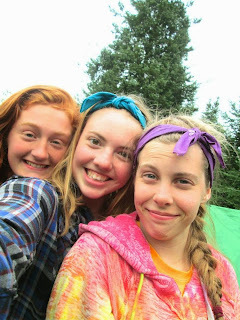 It sounded like heaven to our daughter Kendall, who worked her tail off to earn enough money to participate in the very special summer wilderness canoeing trip last July. The "Nor'Wester” (run by the Green Bay YMCA's Camp U-Nah-Li-Ya, Kendall’s favorite place in the world), is a rite of passage for fortunate Camp Unie teens. It’s something I would never be interested in doing; the idea of not using a real toilet for nine days and getting eaten alive by mosquitoes the size of hamsters just doesn’t appeal to me. Kendall, though, considers the trip a highlight of her life. 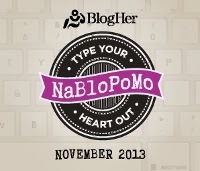 I asked if she would mind writing a little about it for a blog post, and she happily obliged. On the Nor’Wester, I encountered some of the greatest challenges I’ve ever experienced. No matter how difficult any day was, time just flew by. There is no better feeling than tossing a canoe over your shoulders and just owning it. I would crank out a 105-rod* portage and think to myself, “Did I seriously just do that? !” I discovered strength that I never knew I had, and never again will I consider myself weak. 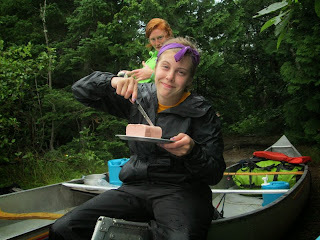 A typical meal on trail is nowhere near glamorous, but we spent a lot of time dreaming about when we could eat next. I developed a strange love for Spam cooked in brown sugar, yard-o-beef by-the-bite, and “nuggets of gold.” Nuggets of gold were made by covering chunks of spreadable cheese in Bisquick batter and boiling said chunks in a concoction of chicken broth and canned vegetables. (I even brought a can of Spam with me to college. I have yet to break it open, because I have no one to share it with!) 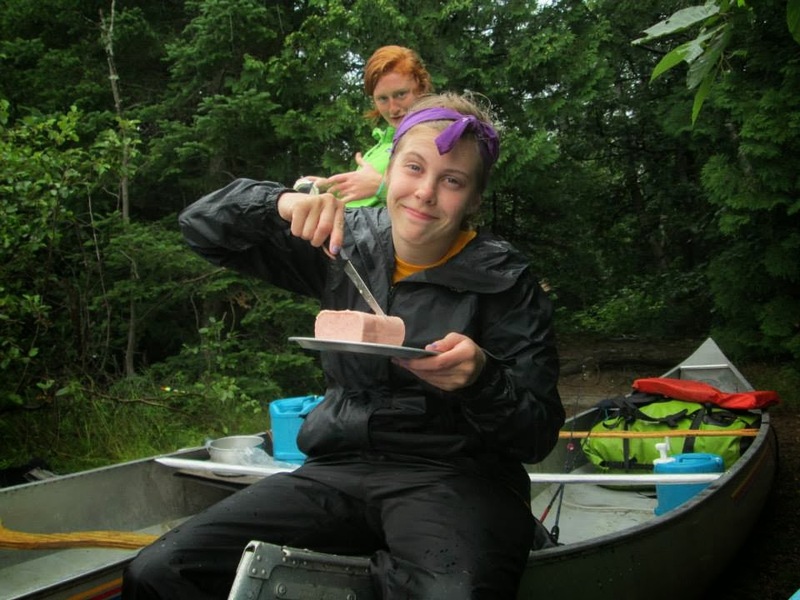 Each breakfast was complemented by instant coffee made with lake water, lunches were spent floating along a lake, and dinners were enjoyed next to a campfire. My counselor, nicknamed “Schmitty,” is one of the greatest women I’ve ever known. She has taught me things that I carry with me each day. Each day she would have to pry out a “high” and a “low” for the day from each of us. At the start of the trip, it was a pain to have to explain our favorite and least favorite parts of the day; it seemed so silly. However, by the end of the trip we were fighting over who got to share first. It became a very important, therapeutic part of each day. Schmitty was constantly helping us realize our own strengths and weaknesses. She was huge on introspection, so we’d spend a solid amount of time each day discovering ourselves, whether we realized it or not! When the sun started setting we’d gather together, throw our arms over each other’s shoulders, and sing Schmitty’s own version of Taps. One moment of the Nor’Wester that I will never forget was the calm before the storm at American Point. The seven of us walked to the opposite side of the island to lie in an open patch between the trees and do a sort of meditation. Lying there with our eyes closed, not one of us noticed the clouds rolling in. Schmitty was asking us questions like, “Who are you?” and “Why are you on this trip?” I became so immersed in thought that I nearly peed my pants when lightning struck the ground nearly 20 feet away from us. We rushed across the island to our campsite and huddled in our tent for the next 36 hours, just napping, eating, and chatting. The lightning had snapped me out of my introspective trance but proceeded to force me into another day’s worth of nothing to do but think. The universe knew I hadn’t quite figured everything out and needed more time. I think that’s why I love storms so much; they’re wake-up calls, reminders that there are things out there bigger than yourself. I believe that one of the greatest things you can do in life is to go outside your comfort zone. I was nervous about the trip, doubting my competence. Fifty-five canoe miles later, I'm so thankful for my friends, who pushed me to shoot for the moon and go for it, because the BWCA is a place that will forever hold a piece of my heart, and I absolutely cannot wait to go back.